A LEADING HOMELESS charity has criticised proposals to stop monthly reporting of homeless figures as “a communications strategy for bad news”. Focus Ireland made the comments after a new report recommended that monthly reporting of homeless figures be discontinued in favour of quarterly reporting instead. The charity also said that two new reports on homelessness are flawed, containing significant gaps and – in the case of one of the reports – being made up of “poorly evidenced opinion”. Director of advocacy Mike Allen also said that one of the reports “seeks to lay the blame for homelessness on the people who experience it”. Yesterday evening Housing Minister Eoghan Murphy published two new reports that had been expected in relation to trends and data around homelessness. One of the reports came from the Dublin Regional Homeless Executive (DRHE) and was ordered by the minister as a response to a large spike in the numbers presenting as homeless in January and February of this year. The purpose of the report is to review and analyse the figures. The other report was from Inter-Agency Group on Homelessness – a cross-departmental group set up to help tackle Ireland’s homelessness crisis. The Inter-Agency Group report has already come under fire for stating that it needs to be considered whether it is appropriate to provide emergency accommodation to families who are unwilling to consider the Housing Assistance Payment. The DRHE report has been strongly criticised for a number of its recommendation and approaches to interpreting the data around homelessness. Currently the number of homeless people residing in state-funded emergency accommodation (commonly referred to as the homeless figures) is published monthly by the Housing Department. Minister Murphy has suggested previously that this should be changed to quarterly reporting. The DRHE report recommends this also. As a reason, it states that trends in people presenting would be more visible; there would be a change for greater analysis; and a more “concerted focus” could be put on patterns in homelessness. However, Focus Ireland dismissed these plans as a “communications strategy for bad news rather than a research strategy to solve the problem”. “Most research reports include a recommendation for ‘more data and more research’, this must be the first to make the strange claim that ‘greater analysis of trends’ would be facilitated by having less data published less frequently,” said Mike Allen. Allen also stated that the DRHE report attempts to lay the blame for homelessness on people who are homeless, rather than on the growing housing crisis and lack of places to live. “This gives the impression that the problem we need to solve is not homelessness but the homeless themselves,” he said. This approach does not reflect the diligence and compassion which is evidenced in the work of the DRHE itself, and will not help us solve the homeless crisis. The report also references a decrease in families exiting homelessness and into tenancies supported through the Housing Assistance Payment (HAP) rental support. The report states that in Dublin, DRHE is seeing a “reluctance and refusal of households” to move into HAP tenancies, and that more needed to be done to make homeless families take up HAP. Focus Ireland take issue with the fact that the report does not mention the “overwhelming evidence” that there was a growing shortage of properties available within HAP limits. “This is the cause of the problem and the primary reasons for the recent growth in family homelessness,” said Allen. Speaking today on RTÉ’s Morning Ireland, DRHE chief executive Eileen Gleeson said that the issue was not “a huge problem for us”. “But we are on a daily basis dealing with the challenge that is homelessness in the Dublin region and anything that we can do to instill confidence in the HAP system and the HAP option, we will do it,” she said. 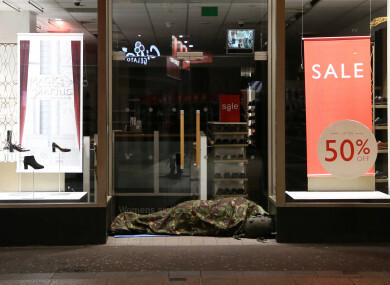 Homelessness in Ireland continues to grow month-on-month. Figures for April show 1,351 families with 2,810 dependents were in emergency accommodation. Housing Minister Murphy is due before an Oireachtas Housing Committee this evening to discuss recent issues around families being removed from the figures over a “categorisation issue”. Email “'A communications strategy': Report criticised for recommending a stop to monthly homeless figures”. Feedback on “'A communications strategy': Report criticised for recommending a stop to monthly homeless figures”.